Darcee was a dream to work with! She took my vision and made it better than I ever could have imagined. She’s truly talented! “I’m sorry we didn’t get a chance to meet. But, thank you so much for all of the amazing flower arrangements! Everything was beautiful and beyond our expectations! We loved everything but especially loved the table runner and bouquet. Also, thank you for the roses and nice card. We couldn’t have asked for better flowers. It was wonderful working with you! I hope we can work together in the future (we will need an excuse for more beautiful arrangements). “As we reminisce on our wedding day, we’re always reminded of the details you created! From our aisle entrance, to the cross and our bouquets, every single part of your creation was absolutely gorgeous, and has played a part in each of our favorite photos!!! 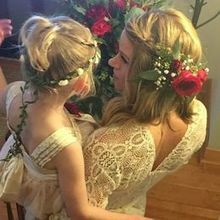 “I CAN’T PUT INTO WORDS HOW MUCH I LOVED MY FLOWERS!!!!! “Thank you again for everything that you did for us for our wedding! We have people still gushing over the entire setup and the bouquets were incredible! Gehrig said . . . Thank you so much for putting together such beautiful bouquets, bouts, corsages, and barrettes. I am so pleased with how the flowers complemented the beauty at Gallatin River Hideaway. It was such a pleasure to work with you. You are so kind and made the process of ordering flowers for our wedding so enjoyable and easy. I’ll be sure to recommend you! Thank you for making this day special for Daniel & Krishell. It means alot to me that you are taking care of the details on the flowers. Beautiful creativity to work with your taste and provide quality caring service and the freshest flowers mostly from her own garden. Book ahead to get exactly the colors and combinations you want and she will make it happen!